We have a strict 30-day cancellation policy. Otherwise payment for the full period is considered due. No refunds on shortened stays. If you must change dates of your visit please let us know as early as possible which will allow us to make the appropriate adjustments. A deposit equal to one night's stay is required at time of booking by acceptable and approved credit card. Balance due will be charged 7 to 29 days prior to arrival on the same credit card used to make the booking. If you would like to pay the balance with another credit card please contact us in advance with the credit card number. Well behaved small and medium sized pets are welcome in SELECT COTTAGES ONLY for additional charge of $25 per pet per night. Pets are required to be leashed and under control while on property grounds at all times. Guests assume responsibility for any damage to rooms and property by pets. Guests are responsible for cleaning up droppings made by pets on the property. Guests may be required to leave early, without refund, in the event of excessive barking that is disruptive to other guests and not quieted down after two warnings. Pets may not be left in rooms or cars unattended. Guests are expected to pick up after their dogs. Prices are based on the number of guests (adults and children are both considered guests) that the room typically accommodates, based on the number of beds and other room facilities. Some rooms can accommodate additional guests up to a maximum number specified. There is an additional charge of $20 per person above the base number and up to the maximum allowed, regardless of age. We are a non-smoking facility. A cleaning fee of $500 will be charged for anyone caught smoking in their cottage. We appreciate that if you must smoke that you do so away from the cottages, beach and other areas utilized by guests. Lakeshore on Salt Spring property is for the use of our registered guests and day visitors may be welcomed with prior approval. All day visitors to our property must check in at the office and are required to sign a waiver of liability to access the property and amenities. Parking is provided for guests and any day visitors will be directed by management as to where appropriate parking is during the time of the visit. Swimming in the lake and use of various watercraft is available at no cost to guests. No lifeguards or watercraft instructors are provided, and guests assume all liability and risks associated with these activities. Children should be supervised by an adult at all times. Please bring all of your belongs to the cottage after use of the beach. Towels are provided for in-room use only. Please bring your own beach towels for yourself and your pets. Guests will be responsible for damage to towels. The guest will be held responsible for any loss or damage to the property caused by themselves, their guests or any person for whom they are responsible, and agree to pay any damages so caused. That there is no lifeguard on duty at any time. Children must be supervised at all times on the property. Life vests must be worn at all times while using resort watercraft. Adult guests or day visitors must sign a waiver at the office, upon entering the property, for themselves and any minors in their care. Further, the guest acknowledges that there may be pets or other wildlife on the property, and hereby unconditionally waives, releases, and discharges Lakeshore on Salt Spring and it’s directors, officers, managers, staff and contractors from any and all loss, damage, or harm that may be incurred from any injuries sustained by any pets and/or wildlife on the property. All our rates are quoted in Canadian dollars per night without tax. There will be a 5% GST plus 8% PST added to all room charges. In respect for other guests, guests are required to cease all music and disruptive noises on the property or in the guest cottage after 11pm or before 8am. The on-site manager will provide one verbal warning. Failure to comply with the notice may result in immediate eviction without refund. Lakeshore on Salt Spring (formerly the Cottage Resort) offers nine resort cottages (from studio to three bedroom) just steps from St. Mary Lake on beautiful Salt Spring Island, British Columbia. Our central location, is a ten minute drive to the island’s famous Saturday market, shops and restaurants in Ganges. We are within walking distance to the island’s golf course, tennis courts, movie theatre, running track and playground. Enjoy lake swimming, fishing and complimentary use of resort watercraft, or just enjoy the peace and tranquility of nature while soaking up some sun. Our fully stocked kitchens and kitchenettes, comfortable beds and bedding, flatscreen cable television and in-room wifi provides our guests with modern comforts. Fireplaces, lake view decks, and jacuzzi tubs are available in select cottages. Read about our many recent improvements and upcoming changes here. 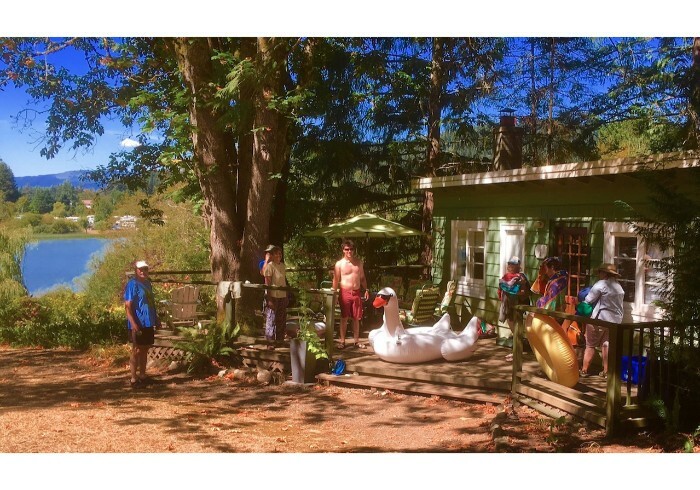 Discover the wonder of Salt Spring Island with friends and family at Lakeshore on Salt Spring.